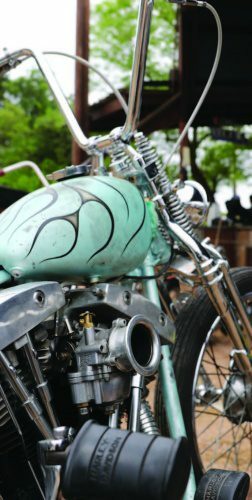 I had heard all about Giddy Up – how Texas knows how to party, how the bikes are top notch, and how the Southern hospitality and incredible BBQ make this show one of the best. It turns out… Everyone was right! I flew down from Wisconsin, and as much as I would have loved to have had my bike, I had an incredible time without it. Fortunately, I have some great friends with queen seats, p-pads, and fenders who were willing to let a gal tag along. We rolled in on Friday afternoon, the day before the show. The majority of the show-goers camp just up the road at Huaco Springs – right on the river. 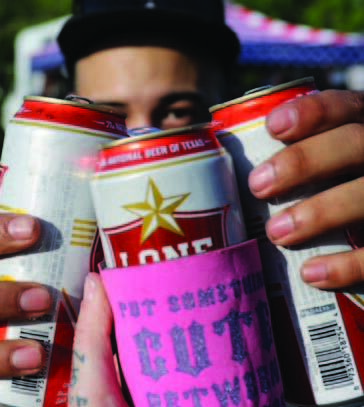 I borrowed a tent and sleeping bag from my buddy Lee, brought a couple of cases of Lone Stars, and the party was on! We woke up the next morning, as fresh as.. well, as fresh as a bunch of campers deep in the heart of Texas could be. 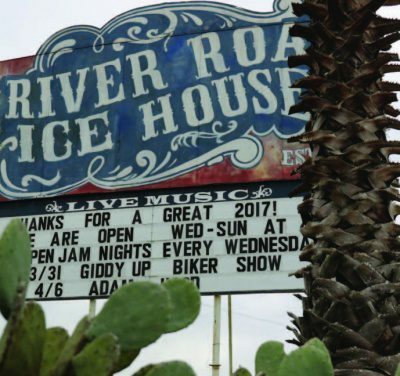 I hitched a ride on a buddy’s p-pad down to the show – which takes place at the River Road Ice House in New Braunfels. This venue is incredible – from the killer bar and stage setup to the vast backyard full of vendors. There was everything from Helmet Division slingin’ and relining helmets, to Cheap Thrills, Sweatshop Industries peddling sissy bar bags, Danger Dan, and vintage shops, and of course, BBQ and tacos! The invited builders’ bikes lined a steep???? 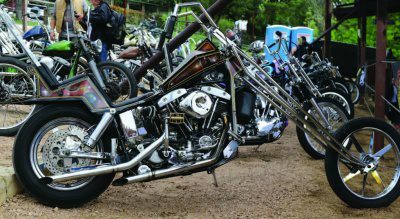 hillside, with incredible builds from Texas and beyond. Dream Co. Cycle Supply brought down his pan, along with Jace (whose belly reads CORNFED) and his “Vacation Forever” swingarm chop. Ben “The Boog” brought his Prismic Boog out too! 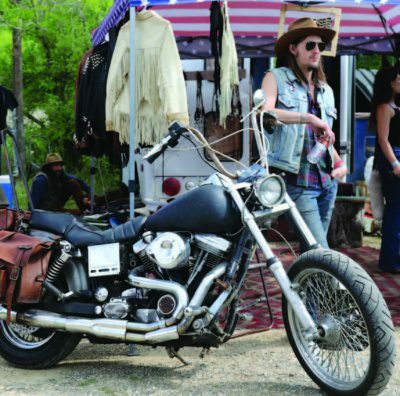 Giddy Up is a one day show, and it likens back to the early days of Born Free – it’s high caliber, Texan fun, with Lone Stars aplenty, warm sun and good people. I foresee this show continuing to grow; it’s already hard to beat! 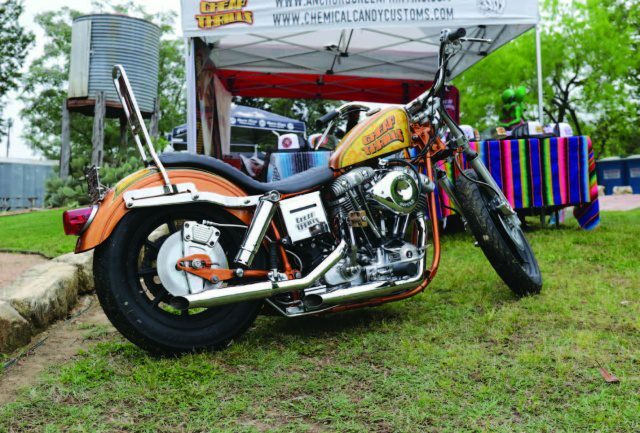 This entry was posted in Event Reports and tagged Back Issue, Cycle Source, Cycle Source Magazine, Event Reports, Events, Giddy Up, Giddy Up Texas, July 2018. Bookmark the permalink.